Various biochemical and analytical techniques require the extraction of protein from tissues or mammalian, yeast and bacterial cells. Obtaining high quality and yields of proteins is important for further downstream protein characterization such as in PAGE, western blotting, mass spectrometry or protein purification. The efficient disruption and homogenization of tissues and cultured cells obtained in just one step using Diagenode's Bioruptor® deliver high quality protein. 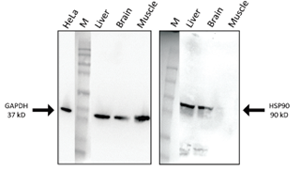 Western blot analysis of GAPDH and HSP90 proteins in tissues (various mouse tissues) and cultured cell extracts (HeLA). 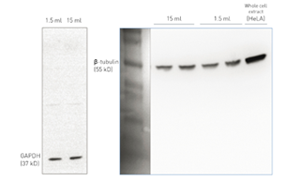 Western blot analysis of GAPDH and ß-tubulin proteins in tissues (mouse liver) and cultured cell extracts (HeLA). Add Protein Extraction kit for Bioruptor® Plus to my shopping cart.